I made this last night and almost fainted. It's super yum, but better than that, it's FAST and EASY. Cook Farfalle according to box. Drain, set aside. 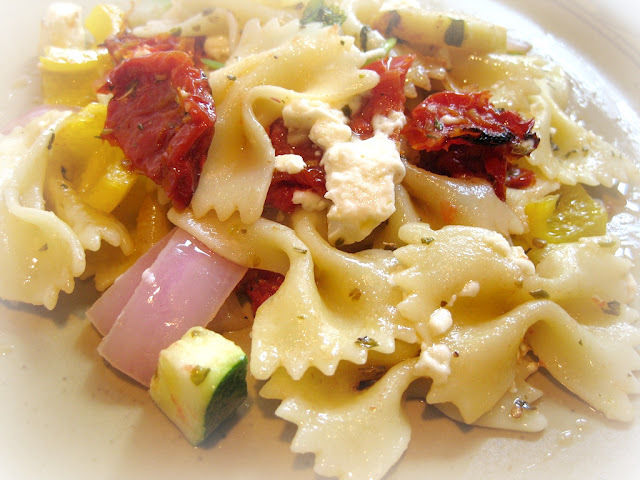 Cut up onion, sweet pepper, zucchini, and sun dried tomatoes: put into pan with 1-2 tablespoons Olive Oil. Sizzle these up for about 5 minutes. Add cooked pasta to dish, sizzle it about 5 min with lid on pan. Drizzle feta cheese over it and let it warm up a min or two. Done. How do you say this? "far-fa-je?" I'm clueless. 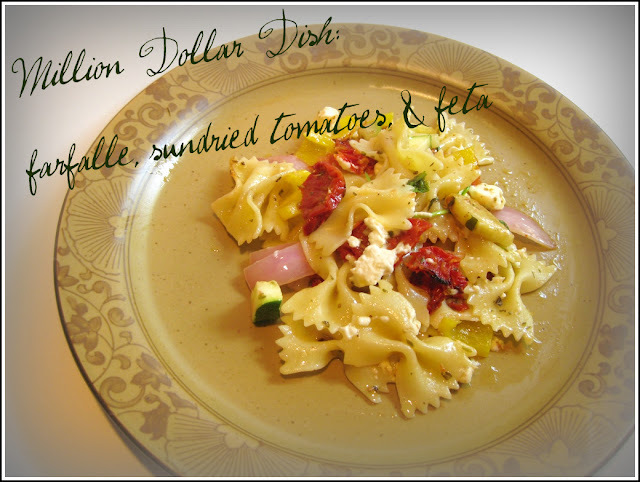 Why is it called the Million Dollar Dish? "THIS tastes like a million dollars hun!" I think it is pronounced far-fell-ee. Then again I am from Tuttle, Ok and what do I know?!!? I am going to try to make this this week! It looks awesome. I had an episode with my stinkin heart yesterday again so I need to start watching my diet A LOT closer! This will have to be my kick off dish!! I always said it "far fel la'" (with an accent on the "la"). Your recipe looks delicious...and perfect for hot weather. I'll have to give it a try.